Portrait of Colonel Linwood M. Gable, MC, Commanding Officer, 231st Station Hospital (seated), and his Executive Officer, Lt. Colonel R. B. Warriner, MC. The 77th / 231st Station Hospital was built on a site requisitioned by the British Ministry of Works in 1943 and selected as the location for a Military Hospital to support nearby bases of the 8th US Army Air Force. The site was located at Morley Hall, Norfolk (later designated US Army Hospital Plant 4210, what is now called, Wymondham College in Norfolk –ed). The medical facility was built under Reverse Lend-Lease arrangements and was completed course of September 1943. The first established unit on the site was the 77th Station Hospital unit, which was later reorganized and redesignated the 231st Station Hospital, on 3 March 1944. On 1 January 1944, the organization (231st Sta Hosp) was in charge of the Hospital Plant installation at Redgrave Park, Suffolk, United Kingdom. At various times in February 1944, groups of personnel were placed on DS with the 77th Station Hospital located at Morley Hall, Norfolk, in anticipation of a possible unit transfer. As of midnight, 3 March 1944, the 231st Station Hospital relinquished responsibility for the Redgrave Park Hospital Plant and assumed full responsibility for the one at Morley Hall. 231st Station Hospital installations at Morley, Wymondham, Norfolk. Housing mainly consisted of brick buildings and Nissen huts, and in peak times (following the D-Day landings) additional ward tents were erected on the grounds. The 231st Station Hospital was a large complex serving 15 Heavy Bomber bases, a Fighter Group, and affiliated service organizations, such as Engineer, Quartermaster, and Ordnance personnel, representing an estimated force of 60,000 men. Most of the surgical services were carried out on casualties arising from the high-altitude missions that took place over occupied and enemy territory (France, Holland, Norway, and Germany). Major statistics: 60% of all casualties received resulted from flak; 15% from cannon shell fragments, and the rest from crashes and flight accidents. The general age of patients was between 18-30 years and almost all injuries/wounds were classed as severe (80% of wounds involved upper and lower extremities; 15% covered head wounds; with only a small number of chest and abdomen wounds, due to the wear of effective protective flak jackets). 2099 patients evacuated by Hospital Trains were treated at the Hospital plant after the D-Day landings (the first trainload being received on 12 Jul 44 –ed). The organization functioned as a Station Hospital during its entire World War II period. Its activity was varied: throughout the whole period, the 231st Station Hospital served as a receiving Hospital for Army Air Force battle casualties rushed direct from operational missions over Europe. After the Invasion of France, Army Ground Forces casualties were also received, after they had been evacuated through more forward echelons. During the latter third part of 1944, the unit was authorized to board patients for transfer to the Zone of Interior, and from this time on it functioned simultaneously as a Station Hospital, a General Hospital, and a forward-echelon Evacuation Hospital (the hospital unit’s first patients were returned to the ZI on 14 Aug 44 –ed). 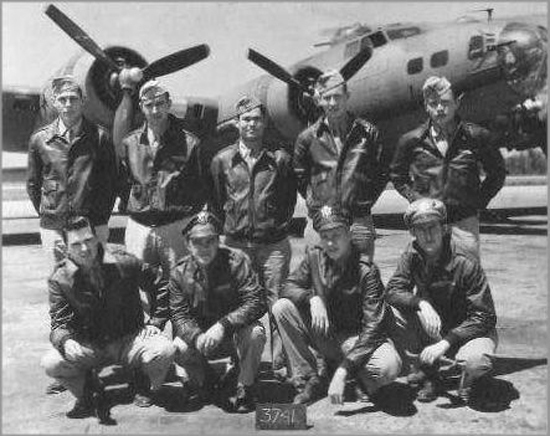 The one unit receiving full medical support from the 231st SH was the 452d Bombardment Group (H), initially commanded by Lt. 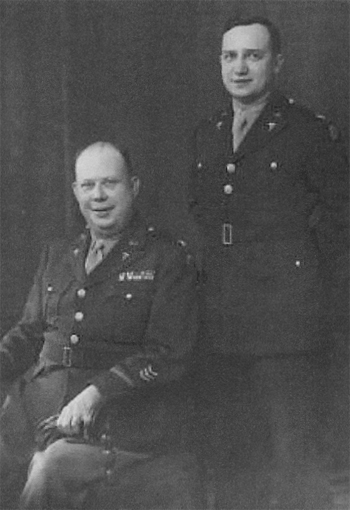 Colonel Herbert O. Wangeman (15 June 1943), and later followed by Lt. Colonel Robert B. Satterwhite (8 February 1944). The unit’s nearest airfield was at Deopham Green (AAF-142, located about 5 ½ miles SW of Wymondham, between Hingham and Great Ellingham). It was constructed during 1942-1943 to Class A specification for heavy bomber use with a 2000-yard runway, intersecting with two 1400-yard auxiliary runways, all 50 yards wide. The airbase had 50 hardstands, 2 hangars, lighting, full technical facilities, and provided accommodation for 2900 men. The 452d BG (H) activated stateside 1 June 1943, flew B-17 aircraft, and comprised the 728th, 729th, 730th and 731st Bombardment Squadrons, assigned to the 45th Combat Bombardment Wing (8th United States Army Air Force). The unit started its activities 3 January 1944, its first action taking place 5 February 1944 over Germany. The Group flew 250 daylight combat missions out of AAF-142 between 5 February 1944 and 21 April 1945, suffering a total loss of 110 aircraft. Its last CO was Colonel Jack E. Schuck (appointed 6 June 1945). The 77th Sta Hosp initially split between Bromsgrove and Erlestoke, Worcestershire, participated in the Rehabilitation Center Number 1 activities (opened on 5 October 1943 in the UK –ed). The program included convalescent reconditioning into Station and General Hospitals of mainly orthopedic patients, but also of general surgical and medical cases. The program allowed a reduction of a patient’s hospital convalescence by about two to three weeks, revived his self-confidence and military spirit, essential for men long confined to bed. Beyond routine medical duties of care for patients, the Hospital conducted experimentation and research in several fields of investigation. Major events were formal inspections by the Surgeon General of the US Army on 11 March and by the Commanding General of the United Kingdom Base on 16 November 1944. The Surgeon General, Major General Norman C. Kirk, was accompanied by Major General Paul R. Hawley (Chief Surgeon ETOUSA), by Major General David N. W. Grant (Chief Surgeon US Army Air Forces), and Brigadier General Malcolm C. Grow (Chief Surgeon 8th USAAF). At a ceremony during his visit, Brigadier General Hawley was invested with the rank of Major General, and was sworn in by Major General Kirk. During this inspection, the Surgeon General saw every orthopedic patient and commended the Hospital for its excellent service. Brigadier General H. B. Vaughan, Jr. (Commanding General United Kingdom Base), also paid a separate visit to the Hospital facilities. Valuable advice and directions related to professional services were provided by Colonel William S. Middleton (Chief Consultant in Medicine, ETOUSA) and by Colonel Elliott C. Cutler (Chief Consultant in Surgery, ETOUSA), who maintained a close relationship with the unit. Lt. Colonel Hugh P. Smith, MC, O-473796, was relieved of his duties on 18 October 1944 as Chief of Medical Service, because of ill health. He was replaced by Captain Benjamin M. Hair, MC, O-1821437, on 15 November 1944. The Neuropsychiatric Section initiated new methods of handling NP patients during this period. The problem was to give definitive treatment to a larger proportion of patients than had previously received it, in order to prevent overcrowding of General Hospitals. 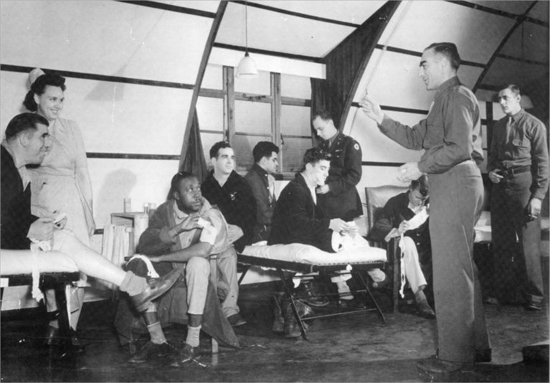 After thorough observation of methods in use at the 312th Station Hospital, the 65th General Hospital, and the 7th General Hospital, a method of treatment was adopted by Major Thomas A. March, MC, Chief of NP Section, combining features found in all three of the Hospitals studied. The method was to administer insulin in progressively larger doses over a period of five to ten days, combined with sedation by amytal. Group psychotherapy was then practised by lecturing the patients on the reasons of their “nervous” conditions. This treatment caused the patient to gain weight and to lose the dreams which had been recurrent during sleep. Anxiety over being in a Hospital was relieved by the use of group psychotherapy. For some patients abreaction treatment was used in which a hypnotic state was induced with the aid of pentathol, and during which the patient recalled and emotionally re-experienced the events which had caused his breakdown. Above treatments were about 50% more effective in completing cures, and it was possible to return about 70% of the cases to full duty in non-combat capacities. Approximately 30 patients were treated each month, of which ¾ had seen action on the continent. Penicillin treatment was initiated for cases of primary and early secondary syphilis, starting 1 July 1944. Instructions emanated from the Office of The Chief Surgeon and were circulated by Letter No. 86, dated 22 January 1944, signed by Major Byron R. Gayman, MC, O-231958. Following a suggestion read in the “British Medical Journal”, a gelatine pastille was prepared, containing 500 units of penicillin, for continuous sucking in mouth infections. A rigid policy was set up and enforced by the Chief of Surgical Service that no person, except patients undergoing operation, should enter the surgical ward chamber without wearing a sterile mask, cap, and gown. This policy applied to all ranks. 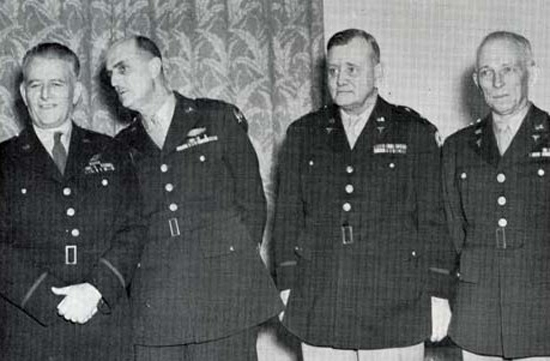 From L to R: Major General Malcolm C. GROW, Major General David N. W. GRANT, Major General Paul R. HAWLEY, Major General Norman T. KIRK. Photo taken in England, 1944. The Orthopedic Section rendered maximum service to Army Air Force units during the three-month period preceding, during, and after D-Day. Sometimes, 2 or 3 missions per day were flown, with a natural increase in casualties. When Hospital Trains (operating in the UK) began to bring in AGF battle casualties to the Hospital, it was discovered that orthopedic cases averaged 1/3 of each trainload. In the semi-permanent Nissen hut installations, the only provision available for a Plaster Room was an 8 x 15 foot side room in the OR building, which proved quite inadequate. A ward tent was therefore erected adjacent to the Operating Room, equipped with electric light, hot and cold running water, and telephone communication. In it were placed all equipment and accessories necessary for reducing fractures, applying and removing casts, and changing dressings. An administrative office was provided within the premises. Another improvement was the establishment of a darkroom tent for rapid development of check X-Rays behind the orthopedic tent (connected by a tunnel passageway). During the first months of 1944, a single Orthopedist (Officer), assisted by one NCO, performed all operations and fracture reductions, and applied all casts. As the volume increased during the Invasion time, night work increased also to the point where, at one stage, the limited staff worked for 11 days and nights without any sleep, and as result “operational fatigue” became manifest. Additional Plaster Technicians were trained and 2 more Officers were added to the professional staff. Extra facilities were organized for maximum efficiency with two augmented wards with a capacity of 51 patients assigned to each Officer. In August 1944, a new method of skin grafting was adopted experimentally and proved amazingly successful. Originally suggested in the “Journal of Surgery, Gynecology, and Obstetrics” (article “Suggested Grafting by Coagulum Contact Method” –ed), the method was used on 40 cases in the Hospital with results showing that the method was almost 100% perfect. Specialist training for the application of subject method was not necessary. In fall of 1944 (November), the 231st Station Hospital was designated as the “Cold Injury Center” of the VII (US) Hospital Group (Provisional) and, during that period, 3 Medical Officers of the Army Air Forces were attached to study any cases of cold injury which would be admitted. The number of cases was negligible, since waist gunners now operated behind closed doors, and heated suits were more efficient. Due to the necessity for extensive work on Army Ground Forces patients hospitalized with the unit, it was arranged that minor dental surgery for patients belonging to other organizations would be carried out in their own Dispensaries. From 1 January to 10 August 1944, a Neurosurgical specialist was assigned to the 231st SH. The Dental Service cooperated with him by making head plates. 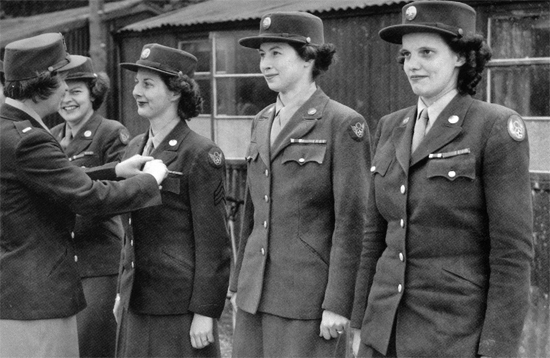 WAC personnel attached to the 8th United States Army Air Force at an awards ceremony somewhere in England, 1944. Improvisation was often necessary due to shortages of equipment. Foot engines used for preparing cavities were now powered by airplane defroster motors run by 24-volt batteries. AAF oxygen tanks were used for compressed air at dental chairs. Field lamps were adapted for use of British-type light bulbs by adapting sockets. An acrylic shade guide for matching teeth was made. Miscellaneous bracket tables, unavailable through ordinary supply channels, were built on site. The Hospital operated a Rehabilitation Program for convalescent patients (since 1 Jan 44). Patients confined to their wards received a daily schedule of calisthenics, while ambulatory cases participated in a program including drill, calisthenics, and classroom subjects. A block of ward buildings was later reconverted as Rehabilitation Training Barracks (with gymnasium, crafts shop, and day room). Together with adjacent tents, they provided a bed capacity for 150 convalescent patients. To enable ANC personnel to carry the extra burden of work without undue fatigue, Nurses were granted a 48-hour informal leave each month. As there were unavoidable difficulties in securing blood donors from nearby organizations, and in order to prevent excessive use of Hospital personnel as donors, the Laboratory Section established its own Blood Bank. The Laboratory also participated in penicillin research directed by higher Headquarters. The bacteria-killing substance was used in mouth hygiene in cooperation with the Dental Service. In addition to training of unit personnel which was maintained throughout the year, the 231st Station trained 15 Enlisted Technicians from other organizations in Dispensary Laboratory techniques. This lasted approximately three weeks, of which about 10 days were spent on hemotology, 4 days in reading GC smears, and about 7 days on urinalysis. In August, at the suggestion of Lt. Colonel D. A. Allen (Chief Consultant Radiography, ETOUSA), a double brick wall was constructed in the X-Ray Department building, dividing the space into two rooms, one of which was set aside for fluoroscopy. 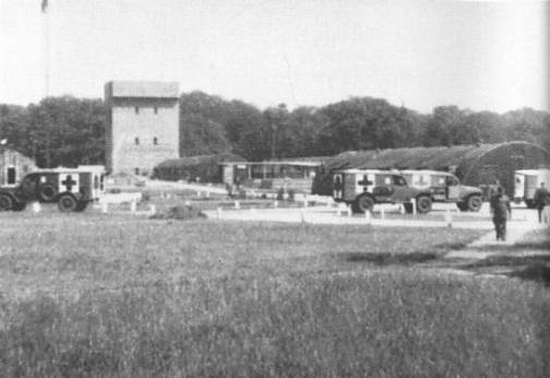 Partial view of the 231st Station Hospital, illustrating the water tower and a number of Ambulance vehicles. The method for filling subscriptions was simplified in order to consume less time for ward personnel. During the early months of 1944, there was a shortage of standard cough syrups, and when an epidemic of nose and throat ailments broke out the Pharmacy staff prepared their own cough mixture. It proved so successful that the formula was adopted by the 136th Station Hospital. Eight Hospital trainloads of casualties were evacuated at Wymondham Railhead, transported by ambulance, bus, and truck to Morley Hall, and admitted to the 231st. It was thought that the technique developed for these evacuations had several points of merit, whereby evacuation by Hospital Train became a SOP for this and other units. Because of mass admissions, all personnel were put to maximum use. Not only men attached to the Post but also convalescent patients were used as litter bearers, mixed with the Hospital’s specially assigned men. Conservation of materials and supplies was effected according to SOP and ruled by the fact that equipment not in daily use on the wards should be turned in to Central Supply for use where needed. A one-week supply of drugs was permitted on the wards. On 29 May, a telephone call was received from the Surgeon, Western Base Section, Communications Zone. Within 24 hours the Hospital was to expand its bed capacity from 834 to 1254. Within the required 24 hours, the MAC Officer (1st Lt. B. Berkowitz –ed) obtained offers of 1200 beds, and actually transported the quantity necessary for the required expansion. The Utilities Department designed and built an entire new set of shelves for storage. The 231st Station Hospital set up a Disposition Board for return of patients to the ZI, because the majority of patients so returned, were usually without clothing and equipment when admitted to the facility, and had to be clothed and equipped before being transferred out. The Unit Supply services were turned into a combination of sub-Quartermaster and sub-Chemical Warfare Service depot. Numerous items of clothing and equipment were stocked, in complete size ranges. Salvage, shoe repair, laundry, dry cleaning, remained continuous operations. A total of 225,000 miles was driven by Motor Pool personnel, with only two minor accidents. Two cargo vehicles were constantly in use, limiting the Hospital’s transportation capacity. During a 4-month period, part of the vehicles was on loan for Invasion purposes, and the unit had to make do without them. At the same time, Army Postal Unit 598 (attached to the Post), had to deadline its trucks for repairs, and Hospital transport was used to carry and distribute mail. 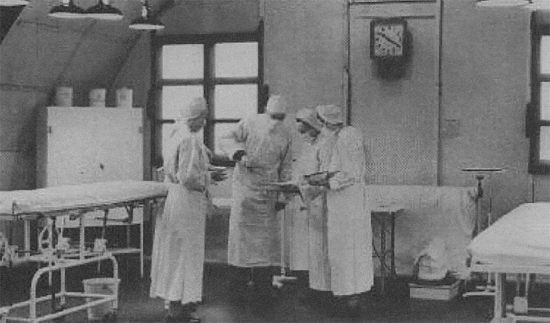 View of one of the operating rooms at the 231st Station Hospital, Morley, Norfolk. A major construction project was accomplished between April and July, when unit personnel (working under direction of Western Base Section engineers) constructed roofing over all the paved walks between wards and connecting the wards with the Patients’ Mess and the Post Theater. A brick-and-tile Meat House was finished in December; a Bake House was added to the Mess; a former warehouse building was renovated and converted into a Clubhouse for the A.R.C. ; a Nissen hut was remodelled and equipped as a Theater; extensive landscaping was carried out during the spring and summer months; concrete was laid for parking areas and approaches to several buildings widened; a combined tennis-basketball court was built. A 15-acre vegetable farm was cultivated on the Post during the year by a Corporal George A. Weller, 271261, Royal Army Pioneer Corps, British Army, on DS with the Hospital. Crops harvested included potatoes, cabbage, carrots, Brussels sprouts, red beets, parsnips, beans, onions, and lettuce. About 75% was used by the Hospital, the remainder was sent to the Subsistence Officer at Quartermaster Depot Q-105. Entertainment and morale factors were available for both patients and staff. Movies were shown, newsreels given, live shows organized and sponsored (USO & ARC), movie stars and entertainers received. The “Gable Gators” the unit’s dance orchestra comprised staff personnel which toured the wards once a month, and gave several concerts in the Post Theater. Recorded classical music concerts were given each week, and the Records Library proved very popular among personnel. Books and Magazines supplied by Special Service were distributed to all wards, barracks, and day rooms. American Red Cross personnel offered various services to the Patients’ wards, to the Clubhouse, and organized event nights, concerts, dances, and special parties and celebrations. Each Sunday afternoon, ‘open house’ was held at the Clubhouse for girls from Wymondham or Attleborough. Trips and outings took place, and visits were arranged to factories, theaters, museums, sites of interests, without cost to the patients. A soda fountain was opened on 25 May. Day rooms were furnished for Officers, Nurses, Noncoms, and Privates. A Bar was opened, during after-duty hours, for EM, and another for Officers and Nurses. Intramural softball tournaments took place, and a basketball team was formed to compete against teams from other bases. Anglo-American relationship was excellent; the Hospital band played a number of concerts and dances for British War Charities, the British Ministry of Information and the English-Speaking Union offered speakers and entertainers, prominent military and civilian leaders gave speeches and discussions. The 231st SH participated in the “Stars and Stripes War Orphan Fund”, raising £111-17s-5d for the support of a British war orphan by voluntary contributions. A special Christmas Party for children of Wymondham and Attleborough (Norfolk) was given on 23 December 1944; Tec 5 Jerome Schwartz was Father Christmas. Purple Hearts awards were made to 61 Officers and 736 Enlisted Men during the year, with further Oak Leaf Cluster awards to 9 Officers and 73 EM. From 1 January until 8 April 1945, the patient census was above the T/O strength for staff and equipment. Originally activated as a 750-bed Hospital, cuts were made twice in strength of staff, yet patient numbers never fell below 1000, and this caused a great strain on personnel and equipment of the organization, which required a lot of ingenuity, improvisation, and plain hard work to overcome. Discipline remained good, although personnel began to show the psychological strain of continuous overseas service. By a liberal pass and leave policy, and repeated instruction in the prevention of venereal diseases, AWOL and VD rates were kept at zero. Another positive measure adopted to raise morale was the expansion of entertainment and recreation services. Partial view of the recovery ward at the 231st Station Hospital, at Morley, Norfolk. Some patients and hospital personnel are having a friendly conversation. A detachment of German PWs was stationed at the Hospital on 28 April 1945. An enclosure (PW cage) had been fenced in, but all work for providing shelter had to be done by the prisoners themselves. They were also further assigned to duty performing manual labor in the kitchens and as orderlies. A PW detail was set to surfacing the roofs of the Nissen huts on the Post with tar. 20 Enlisted personnel were transferred to combat forces in addition to those who had already been transferred the year before. They were replaced by limited assignment men who had been transferred from line organizations. Under authority of General Order # 10, United Kingdom Base, ComZ, dated 3 February 1945, ETOUSA disbanded the VII (US) Hospital Group (Provisional) with functions now assumed by the 805th Hospital Center. Effective, at 2400 hours, 14 April 1945, Eastern District, United Kingdom Base, was disbanded under authority of Section I, General Order # 32, United Kingdom Base, ComZ, ETOUSA, dated 28 March 1945. Finally, the 231st Station Hospital was reorganized on 21 March 1945, under Column 18, T/O & E, 28 October 1944, per Letter AG 322, OPGC, Headquarters Communications Zone, European Theater of Operations, US Army, Subject: Organization Order No. 204, dated 21 March 1945. The organization continued to occupy US Army Hospital Plant 4210, located at Morley Hall, Norfolk, England. The 1366th Labor Supervision Company was activated 2 March 1945, under T/O & E 2-20T, dated 9 January 1945, per authority contained in Letter, AG 21 March 1945, OPGC, Headquarters Communications Zone, 21 February 1945, Subject: Organization Order # 119. Captain Joseph Hillel, MC, O-496445, was made responsible for the Infectious Disease Section. Captain Benjamin M. Hair, MC, O-1821437, was promoted to Major on 16 April 1945. Because of illness, Lt. Colonel Pedro L. W. Platou, MC, was replaced by Major Conrad G. Collins, MC, O-1703641, as Chief of Surgical Service, effective 1 April and up to 8 May 1945. The overall number of surgical admissions of Army Air Force personnel dropped because of decrease in ‘flak’ in Europe. In April 1945, nearly all ward tents were closed, with 5 taken down and removed. Non-absorbable sutures were now used in larger quantities, especially cotton, in place of catgut. Coagulum contact method of skin grafting continued with uniformly excellent results. As several blood transfusions reactions occurred (because of the Rh factor), it was recommended that Station Hospitals be equipped to examine patients’ blood for the Rhesus factor. The Orthopedic Section received more cases due to the tactics used by the Army Air Forces to repel the German counterattacks. Bombers and fighters took off almost every day regardless of weather. An increase in the number of crash take-offs and crash landings resulted (causing multiplicity of fractures). There was a total lack of infections, such as tetanus or gas gangrene, while the pyogenic infection rate was less than one percent. A steady decline in NP ascribed to the fact that the end of the war in Europe was clearly in sight took place until April. After this month, the number of admissions rose again. The increase seemed to come from limited assignment personnel who had been reclassified from combat duty with the AGF to non-combat duty with Army Air Forces, and who were suffering from recurrent attacks of nervous disorders. Air Force ground crews who had been stationed for long periods overseas were also prominently represented among the NP admissions. German PW detail at work on the grounds occupied by the 231st Station Hospital. Many medical organizations employed enemy labor tasked with some basic maintenance and repair work at their installations. In cases of acute and severe tonsillitis that failed to respond to routine treatment at Station Dispensaries, a penicillin drip was used orally with very encouraging results. It was therefore continued in the Respiratory Disease Section. The number of sittings in the Dental Section (surgery) remained large and represented an average of 1000 per month (1200 for Jan 45). Just before V-E Day, a sudden increase in patients was registered, attributed to the fact that USAAF personnel took advantage of the slackening combat operations and duties, to have their teeth examined, surveyed, cleaned, and worked on. In the same period, five Hospital trainloads of patients (1155 patients) were surveyed and treated. Five Hospital trainloads of casualties were evacuated at Wymondham, Railhead, Norfolk, transported by ambulance, bus and truck to Morley Hall and admitted to the 231st SH. In spite of the large patient census and the heavy workload, a number of new construction jobs were completed (mostly by unit labor). 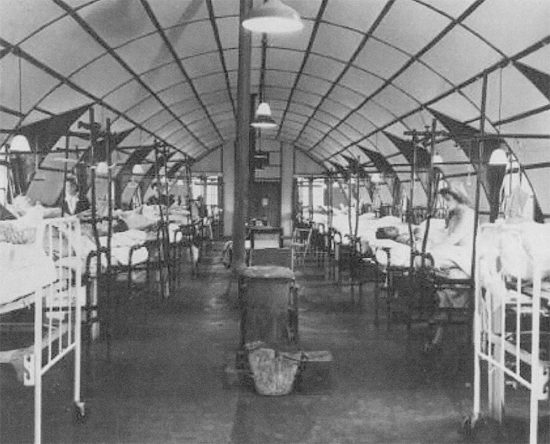 The system of covered ways was extended to include the Nurses’ area. All ward tents were finally winterized. In February 1945, a brick structure was built to accommodate the Linen Supply Section, which had outgrown its facilities. 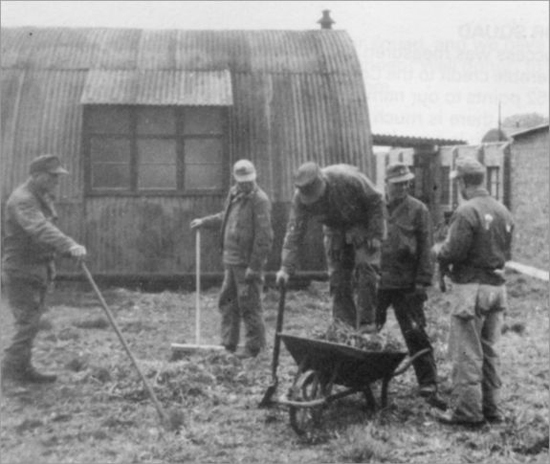 In March, a new double Nissen hut was erected for Red Cross activities. Kitchens and latrines on all wards were painted, as well as the interiors of all offices. Construction of a PW enclosure was started. New equipment was received, including a new X-Ray machine for the Dental Service, a new centrifuge for the Lab, a PA address system to all wards, and an intercom system from the telephone exchange to the Officers’ Quarters. Even a beauty shop was equipped and staffed for female personnel. A section of the Patients’ Mess was converted into a bakery. Food waste was cut drastically and maintained at a level of about 3 ounces daily per person. Extra entertainment and morale factors were introduced, with a broadcasting studio with news releases, music requests, and records’ selection. The “Gable Gators”, the Hospital’s dance band continued to play for parties and dances both on and off the Post. On 7 May 1945, they even played at “Rainbow Corner” (London Club -ed). A new building was constructed for the American Red Cross staff; named “Medo-Club” it was used for dances, shows, and indoor spots, while the old building, named the “ARC-ade Club” retained its former functions. The 231st Station Hospital was officially closed as of 2400 hours, 8 June 1945, under authority of Letter, European Theater of Operations, 18 June 1945, Subject: Opening and Closing of Hospitals. Per Paragraph 8, Letter UK Base, 28 June 1945, Subject: Assignment and Attachment Order No. 91, the following units were released from attachment: 436th and 437th Military Police Gate and Patrol Detachments. Per VOCO, 805th Hospital Center, Newmarket, United Kingdom, the evacuation of 474 patients was carried out in two days, on 9 and 10 June 1945 with the cooperation of the Dispensaries of the Air Stations serviced by the Hospital. All available ambulances (Army and Air Force) within a radius of twenty miles were borrowed so that patients could be transported in comfort to their new destination – the 65th General Hospital and the 163d General Hospital. General view of a medical ward at the 231st Station Hospital. All medical supplies were packed and shipped in three days (after evacuation of the patients). After closing of the Hospital Plant, the buildings and grounds were thoroughly policed. An accelerated training program was adopted for the purpose of reconditioning all personnel physically and orientating them on the medical problems of service in the Orient. At the same time, personnel were encouraged to take their furloughs and leaves. In the mean time, Adjusted Service Rating (ASR) Scores were computed and physical inspections made. Redeployment of Officers and Nurses was effected first (chiefly during the last week of June 1945). Enlisted Men over 42 years of age were transferred to the 10th Reinforcement Depot on 10 May 1945 (in preparation for Discharge). Hospital Records were inspected for the last time on 28 June 1945. In the end, the 231st Station Hospital was designated a Category II unit, scheduled for direct shipment to the Pacific Theater of Operations. Our sincere thanks go to Brian Siddall, WW2 Historian and Researcher who provided us with some vintage documents relating to subject Hospital unit. The MRC Staff are still looking for missing data related to the early activation of the unit, its redeployment and return to the ZI for inactivation. Some of the photos are courtesy 452d BG, Control Towers Co. UK, and Wymondham, Norfolk, UK websites. Any additional data about the 77th Station / 231st Station Hospitals will be gladly received and duly credited. Thank you. This page was printed from the WW2 US Medical Research Centre on 26th April 2019 at 02:44.